On the Hunt for a New Mascara this summer??? Maybe this mascara is for you! If you are looking for a mascara that doesn’t run and give you a black ring around your eye running down toward your cheeks too. Try Blinc mascara. It is a no-smudge,no-hassle mascara. Instead of painting your eye lashes you tube them with tiny water-resistant tubes around your lashes. Not a conventional mascara. Once applied,this mascara tubes and binds your lashes and cannot and does not run,smudge,clump or flake,even if you cry at your wedding,workout,jog or rub your eyes!!! You simply remove it with a luke warm washcloth and no makeup remover needed. Today I am wearing the deep purple. I LOVE the way it brightens my eye and take away a tired dark circled appearance. 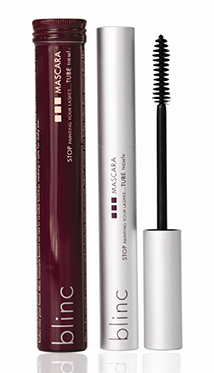 Celebrities use it and you will love it too…if you want easy to remove and longer lasting smudge free mascara. Become a Sleeping Beauty by sleeping. Guys or Gals we need a good night’s sleep. Research shows if you TRY going to bed 15 minutes earlier,for four nights straight you’ll establish a pattern or routine where you get an extra hour of dark circle-zapping and not look so tired rest. It is necessary to get at least eight hours of sleep. Say no to coffee of caffeine drinks after 3:00pm and avoid exercise at least three hours before bedtime. Get some zzzzzzzzzzzzz”s….IF you can’t fall asleep. Get out of bed and make some chamomile hot tea or drink a glass of milk. They really work~most of the time. I travel lots and am often in different time zones.So, I know these drinks help. If they don’t do it for you try a short warm epsom salt and lavender bath before you go to bed.